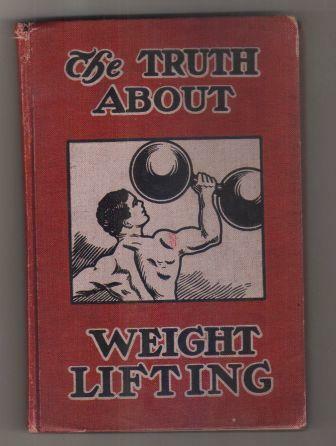 The book above is part of my collection of rare, first edition fitness books. It is also one of my favorites. It was written by Alan Calvert and published by the author in 1911. The cost of this book was “$1.00 net”. The book is full of gems. Phrases such as “Most lifters are of phlegmatic temperament” which means meek, thoughtful, reasonable, calm, patient, caring, and tolerant, make me chuckle. Most professional lifters train only for a short time everyday. Some lifters only train three or four times a week. A total of 2 hours time each week is more than enough to keep a man in the highest possible condition, and it is also enough to develop a novice from a totally undeveloped condition into a perfect Hercules….the man who practices weight training scarcely has to train at all. In last Sunday’s New York Times there was an article by Gretchen Reynold’s titled: How to Get Fit in A Few Minutes a Week. Boiled down to the nitty gritty, researchers found that short, brief but intense bouts of cardio did as well or better than the traditional forms of cardio for improvements in fitness. In other words, long drawn out bouts of plodding on the treadmill or stepper is an inefficient use of your fitness time. You can get the same and better benefits training harder but briefer. And no – you’re not losing more fat by plodding away for hours either. Most of the energy you use when doing cardio come from glycogen (sugar) stored in your muscles – not from the fat on your hips, thighs and belly. What…you didn’t know that? 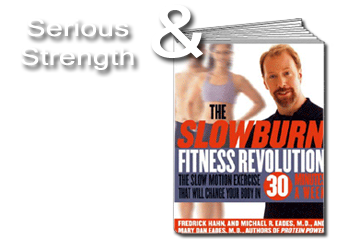 As many of you are aware, I have been a staunch advocate of brief, intense strength workouts long before my first book The Slow Burn Fitness Revolution: The Slow Motion Exercise That Will Change Your Body In 30 Minutes A Week. was published. Short, intense and brief strength workouts work and they work well – if you are willing to put a solid effort into each and every set you do. Here is my daughter Georgia, who is 6 years old in this video, doing some serious work at my gym Serious Strength Personal Training. I am not the person who invented the concept of less is more when it comes to exercise by any stretch of the imagination. I am just one of the many who have helped to popularize the concept. If any contemporary fitness individual should get the credit for inventing the concept, it would be Arthur Jones, the tough talking, pistol wielding, renaissance man who invented Nautilus and MedX exercise equipment. At any rate, while it is true that HIIT cardio training (as mentioned in the NY Times article) is different from HIT weight training, the type of stimulation to the muscles is very similar. Intense muscular effort calls upon the higher threshold (the so-called fast twitch) motor units to engage (as in sprinting or lifting a very heavy object) and results in increased total mitochondria (not mitochondrial density – two different things which researchers often goof up on) thus improving endurance and aerobic capacity. Mitochondria are the energy producing cellular power plants of the cells. Intense efforts are the key to producing the results you require – if time is something you value that is. You don’t need a lot of total work. I’ve said it before and I’ll say it again, to improve your physique or figure, what and how you eat is 99% of that battle. Productive exercise, meaning, exercise that produces positive tissue remodeling (denser bones and more muscle) requires very little time per week to achieve. As little as 15-30 minutes a week. Even less. Great article Fred! I really like the part about putting the great effort in from the get go. That is awesome that your daughter is into all this. Arthur was a piece of work, lol. Thanks pal! Arthur was a piece of work. I met him only once at a MedX sales-pitch meeting in Florida back in 1992. Intimidating figure, but you could tell he’d be honest as hell with you always, no matter what. Refreshing in a person. With that being said what is your opinion if a trainee performs only HIIT instead of only HIT (i.e. slow burn)? What if a trainee performs both? Hi Tony – My opinion is that the typical person does not need HIIT if they are engaged in a sound HIT program but the reverse is NOT true. Love to do a study on that! Both might produce better benefits in some ways but I don’t think much. Phlegmatic means laid back, calm, not easily excitable. It doesn’t mean meek or submissive. Yes it does if you look it up but you are correct that what Calvert probably meant was what I changed it to. Thanks for the correction. Previous post: Can You Afford To Eat Well?